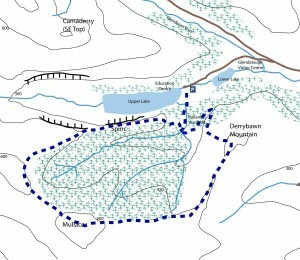 An alternative to the Spinc walk, this is a longer walk that loops to the south to take in Mullacor and Derrybawn mountains returning via part of the Wicklow Way. 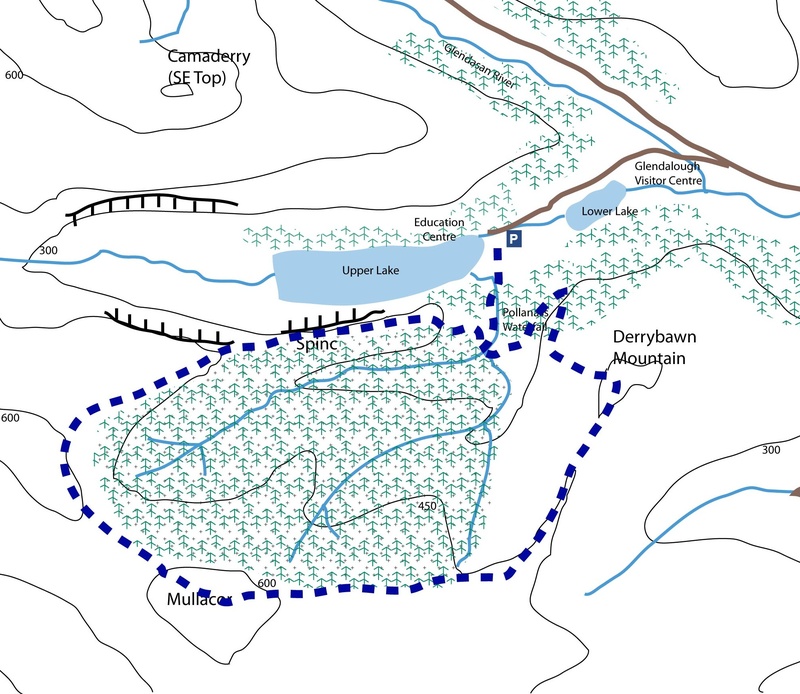 Starting from the car park at the Upper Lough in Glendalough, take the path southwards to the base of the Poullanass Waterfall. Cross the bridge and follow the path uphill that runs beside the waterfall. At the top of the waterfall, a number of paths head off in different directions. Take the right-hand path, continuing uphill. After the first bend, there is a stile on the right which is easy identified by the sign warning about the need for appropriate outdoor footwear etc. Cross the stile and head steeply uphill. On reaching the top of the path, the reward is a spectacular view over Glendalough and the surrounding hills. The Spinc is a ridge extending to the west parallel to the Upper Lough. Follow the clearly visible boardwalk path along this ridge. The path is level and the easy walk along the ridge allows time to enjoy the views. When the forest bears away to the left, leave the boardwalk and follow the path to the pass between Lugduff and Mullacor. Use the boardwalk here to avoid as much of the bog as possible ! Climb steeply to the summit of Mullacor. Descend via the eastern shoulder of Mullacor to reach the path along the Derrybawn Ridge to the summit of Derrybawn mountain. Descend via the steep path to the forest. Cross the stile and continue on the path to join the Wicklow Way. Keeping on the Wicklow Way, return to Poullanass Waterfall and Glendalough. I did this walk yesterday (with another guide) so on reading this I think this is a little vague. First off, the route from the path by the waterfall to the Spinc is via sleeper steps (not mentioned here). Then when walking on the sleepers along the Spinc, eventually take the left at the fork, follow these sleepers and subsequent path alongside the forest and as it ends, follow the clear path south-west towards Mullocor. When heading to Derrybawn, keep heading east and follow the clear path, heading east along the rocky ridge to Derrybawn. Then something I don’t think is clear here – when descending off Derrybawn stick left (there is a path fork). The left brings you straight to the stile. Cross this, descend to the second path, turn left, cross two bridges and follow the wicklow way pack to the carpark. Hope this helps, enjoy! I did this walk today. Absolutely fantastic scenery and wonderful route. For fit walkers it took 3.5 hours so the above estimete for timing is very fair. Lovely walk. It took us 4 hours. A couple of notes: Firstly you can just follow the red route until you get to Mullacor (so, follow the red route from the valley but after crossing the sleepers in the bog you carry on up the summit in front of you: Mullacor.). When you descend the other side of Mullacor you will come to a fence. Stay to the left of this fence to access the path to Derrybawn.